Apple is reportedly using an iPhone 4/4S housing to test the performance of its new A5X processor, which is destined for its upcoming iPhone. The chip is said to be a scaled down version of the graphics-intense unit in the new iPad, as the iPhone doesn't of course need to have such a pixel-cruncher in it, as its display will be smaller. That's in line with the reporting from last month that the A5X won't come to this year's iPhone as it is. The amount of RAM will get increased to 1GB in the new iPhone as well, though. The internal codename for the prototype phone with the new iPhone A5X chip is N96, but it is too early to tell if it will stick around like that. Cupertino is also prepping a refresh of its oft-forgotten third iOS device, the iPod touch, for this year as well. A file inside one of the internal iOS 5.1 builds reveals that the iPod touch will jump from version 4, 1 to being referred as 5, 1 internally, signaling a major overhaul. I hope it's just for testing purposes because if it isn't then the new iPhone will be another fail as the iPhone 4S is. Was the 4S a fail? I seem to recall it being the best selling iPhone ever! I don't know if it is the best selling iPhone ever, but what I am talking about was the specs. For instance the iPhone 4S uninspired design, a rehash of the iPhone 4. The weak dual-core 800MHz processor. The only thing that was anything cool was Siri. (when it works) I thought iPhone 4S sales slowed down just like the new iPad sales are slowing down? easier how? the tiny screen or the lack of options in the browser? is the i4s fluid? yes it is. Does it need that power? no not really. its turned down to save juice because the OS does not benefit from dual core like android does. The only real benefit of the new chip for iOS was the bigger GPU that got attached for gaming. The rest was just so it didnt seem like it was behind the trends. Sorry, but ill take the larger screen and flash over a little extra UI smoothness. well then +1 to you, for +1 me. lolz. i wouldnt have, but the words looked so tasty i couldnt help myself! funny thing. a high end android phone is smooth, and the SGS2 has better battery life than the i4s. true story. of course its more smooth, its a mobile browser with no options. lol. if i turn everything off on my galaxy, it runs smooth as heck too!! id rather have the options. "beats its own predecessors" is the key phrase. 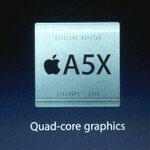 You can't expect the new iPhone to be a single core with a 5 megapixel camera do you? Or maybe they would do that, you'd still buy it anyway. Are you stupid? You said it yourself, they're mid and low ends. At least even there it improved folds over what how the iPhone does. Just last year a low end phone would be a 600Mhz model with 512MB RAM. Now a 1GHz with 700+ RAM is counted as a low end/mid range. You don't see a company's flagship dropping in specs do you? best selling initial launch. the i4 had an 18 month sales window all by itself. its going to be a while before thats beat. With the supposed (but not guaranteed) LTE, they could call it the iPhone 4G! SCREW YOU! I'm an advid iTouch user, You see iOS is too simple for a phone, it limits it too much, makes it like an advanced feature phone. Android makes a phone a real smart phone, makes it truly computer like. But for an MP3 player, iOS is PERFECT! Which is why I like my iTouch so much, that and the iPhone 4 in a case is a friggin brick, but the iTouch is slim.